Intelligence and ambition catapulted Sarah Jennings (Jenyns) to the center of English political life, where she remained for more than half a century. Born into a relatively poor gentry family, she entered the household of the duke of York in 1573 as a maid of honor. There she befriended the duke’s daughter, Anne, future queen of England. 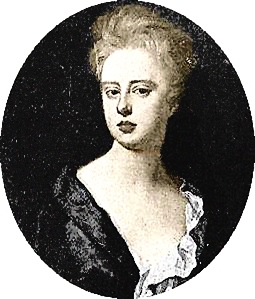 Anne’s reliance on Sarah, for counsel and affection, grew stronger over the years; in 1702, when Anne assumed the throne, Sarah and her husband, the duke of Marlborough, were members of the inner circle, wielding enormous power over the new monarch. Sarah became mistress of the robes, groom of the stole, keeper of the privy purse, and ranger of Windsor Park. She was, in effect, the conduit to the queen, and it was prudent to maintain good relations with her. The women’s friendship gradually eroded, however, under the weight of Anne’s dependency and Sarah’s brittle nature. In 1711, Sarah was dismissed from court and the two never met again.